Strong Typhoon Bolaven is heading toward the Japanese island of Okinawa. Slow-moving Typhoon Bolaven is expected to hit later on Sunday, with forecasters saying it could develop into the strongest storm to strike the island in more than 50 years. Residents have been told to stay indoors and protect themselves against the strong winds and heavy rains. State broadcaster NHK said gusts could overturn cars, while waves around the island could reach 12 m (40ft). Japan’s meteorological agency estimated wind speeds near the storm’s centre at around 180 km/h (112 mph), while extremely strong gusts were reaching 252 km/h. All domestic and international flights out of the island’s Naha Airport have been cancelled. According to news agency AP, some 200 households are already without electricity and around 300 people have taken shelter in public buildings on the island. Typhoon Bolaven has already affected parts of China and comes just after Typhoon Temblin, which caused widespread damage in Taiwan earlier this week. 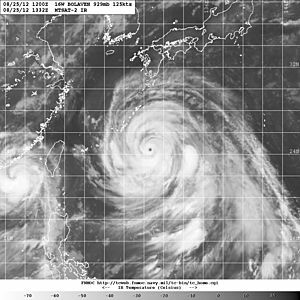 The latest typhoon is the 15th destructive storm of the season in East Asia.